Mannes School of Music Brass Orchestra and University of Scranton Singers will perform “In Concert” Sunday, April 14, 7:30 p.m. in the University’s Houlihan-McLean Center. Admission is free. 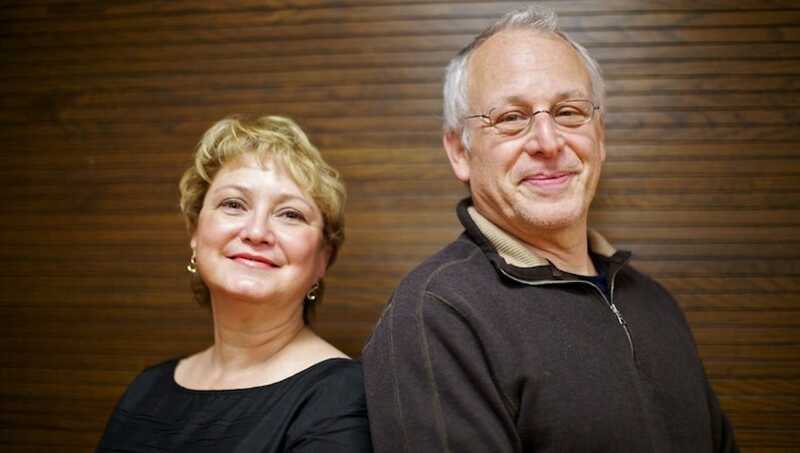 From left: Cheryl Y. Boga, Performance Music conductor and director, and Mark Gould, musician, conductor, teacher and director of the Mannes School of Music Brass Orchestra. Once again, Performance Music at The University of Scranton will welcome back Mark Gould and the Mannes School of Music Brass Orchestra for a Sunday, April 14, concert with the University of Scranton Singers. The concert will begin at 7:30 p.m. in the University’s Houlihan-McLean Center, Mulberry Street and Jefferson Avenue. Admission is free, with seating on a first-come, first-seated basis. The brass ensemble and choir will each perform one third of the program and present combined performances together for the final third of the evening. According to Performance Music Conductor and Director Cheryl Y. Boga, this will mark the ninth time Performance Music has collaborated with a brass conservatory ensemble directed by Gould, who served as the principal trumpeter for the Metropolitan Opera from 1974 to 2003. According to Boga, the concert is a natural outgrowth of a successful string of other musical collaborations between the two music directors. “Maestro Gould has done a lot for and with our programs here. He was the inspiration for and co-founder of the Scranton Brass Orchestra and Scranton Brass Seminar,” Boga said of Gould. Through the years, Gould has brought brass conservatory players from The Juilliard School and the Manhattan School of Music to the University. This will mark the second consecutive Scranton visit for students from Mannes, where Gould has directed the brass ensembles, made up of select undergraduate and graduate brass students, since 2017. Part of New York City’s The New School, Mannes has been in existence for more than a century and is among the country’s premier music conservatories, with programs at the pre-college, undergraduate and graduate level. The Mannes players will be collaborating for the second time with the 50-member University Singers, a mixed choir founded more than a half-century ago and made up of students from majors spanning the curriculum. All enrolled Scranton students are eligible for membership in the Performance Music ensembles, which include both vocal and instrumental groups. A highly in-demand musician, conductor and teacher, Gould has conducted and performed as a soloist with orchestras throughout the world. He has recorded several albums as director of The New York Trumpet Ensemble, and has been a frequent guest with Speculum Musicae, Chamber Music Society of Lincoln Center, the MET Chamber Ensemble, Empire Brass, Canadian Brass, Summit Brass, the Graham Ashton Brass Ensemble and Extension Ensemble. Gould’s students play in many of the major orchestras and chamber ensembles of the world, including the Boston Symphony Orchestra, the Cleveland Orchestra, the Philadelphia Orchestra, Chicago Symphony, Milwaukee Symphony, Seattle Symphony, New York Brass Quintet, Canadian Brass, Empire Brass, Boston Brass, Meridian Arts Ensemble and many others. He is a much sought after teacher throughout the world and has spent considerable time in Japan and Europe as a teacher and clinician. As principal trumpet of the Met, Gould performed on more than 40 “Live from Lincoln Center” performances on PBS, as well as numerous audio recordings of operas and symphonic works, including the Grammy Award-winning recordings of “The Ring of the Nibelung” and “Parsifal” for Deutsche Grammophon. For further information on the concert, call 570-941-7624, email music@scranton.edu or visit scranton.edu/music. For more on the Mannes School of Music, visit newschool.edu/mannes.